An insulator with Performance Contracting Inc., installs insulation on the underside of the caustic scrubber before it is lifted into the LAW Facility and placed in its design location. The last major piece of equipment for the Low-Activity Waste Facility was received at the Hanford Vit Plant in November. “Receipt of the caustic scrubber is a major turning point in construction of the LAW Facility. It sets the stage for completing construction of the LAW Facility in 2018,” said Kim Irwin, area project manager for the LAW Facility. The exhaust from the 300-ton waste glass melters will be treated to remove contaminants from the offgas to ensure it meets requirements before it is released to the environment. The 19-ton caustic scrubber is part of the offgas treatment system. 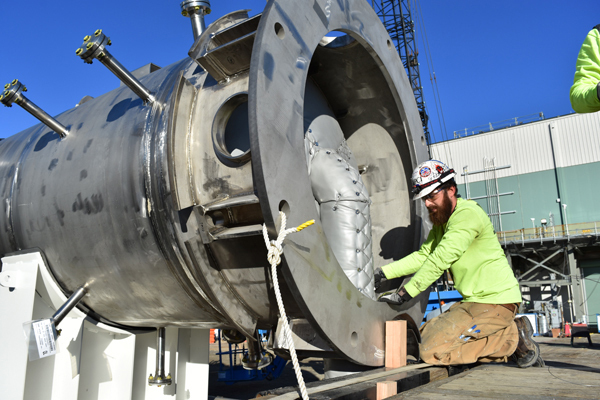 The 28.5-foot tall, 5.5-foot-in-diameter unit was lowered into the LAW Facility through the roof and will be connected to other components of the offgas treatment system. The caustic scrubber is the third of three major components of the melter offgas treatment system received in FY2016. The thermal catalytic oxidizer and ammonia dilution skid were installed in July. Employees also completed fabrication work on two 300-ton melters this fiscal year that will be the heart of the vitrification process in the LAW Facility. "The physical progress made this past year at the Vit Plant is very apparent to our staff and visitors," ORP Manager Kevin Smith said. "The construction progress moves us closer to achieving our direct feed of low-activity waste as soon as 2022." The LAW Facility is the centerpiece of DOE’s sequenced approach to beginning the treatment of Hanford’s tank waste as soon as 2022, known as Direct Feed LAW (DFLAW). Read more about this important progress at http://bit.ly/2flM3Jp. Mississippi State University experts have been conducting tests of HEPA filters planned for Vit Plant facilities by simulating operating conditions, including those that could be caused by an accident such as an earthquake or fire, in these chambers (pictured). The Hanford Vit Plant awarded more than $155 million in subcontracts to businesses across the United States in Fiscal Year 2016 with a growing emphasis on equipment and goods that meet highly specialized requirements for nuclear quality. As the Vit Plant transitions from construction activities toward startup and commissioning, a larger percent of subcontracts are being awarded to businesses across the country for nuclear-grade equipment and services. For example, Mississippi State University (MSU) received $3.2 million to conduct tests of high-efficiency particulate air (HEPA) filters to determine their performance against nuclear industry standards set by the American Society of Mechanical Engineers and against Vit Plant-specific requirements. 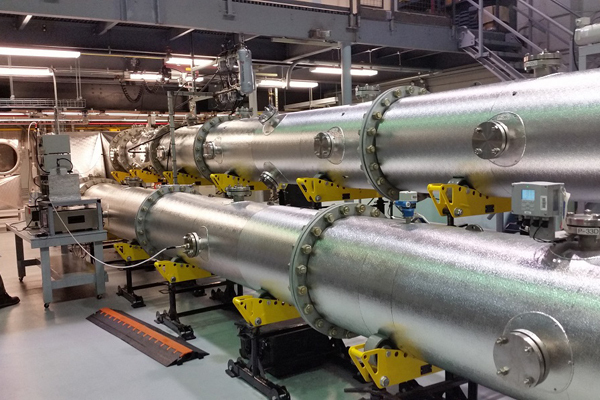 These filters will be used in the plant’s three nuclear processing facilities: Pretreatment, Low-Activity Waste and High-Level Waste facilities. Of the $155 million, $98 million was spent in Washington and Oregon with $62 million of that in the Tri-Cities, where the Vit Plant is based. Local businesses provided goods and services such as safety supplies, small tools, electrical supplies and vehicle maintenance. An example of new work awarded in FY16 to local businesses is a subcontract with Tri-City Industrial for industrial supply products, such as small operating tools, construction equipment and electrical supplies. Since Bechtel began construction of the Vit Plant, it has spent more than $4 billion in goods and services with companies across the United States. Of that, $1.8 billion has been in Washington and Oregon, with $1.27 billion in the Tri-Cities. For more about FY16 spending, visit http://bit.ly/2fAEjnr. 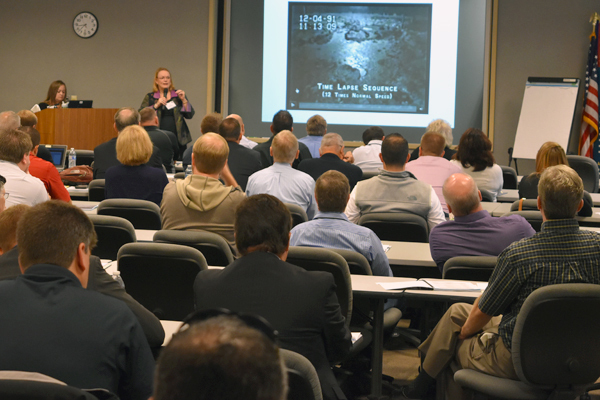 The Procurement and Subcontracts department at the Hanford Vit Plant continued its focus on improving quality through increased collaboration with supply chain vendors at the second annual Supply Chain Collaboration Event in Richland. Representatives from 40 of the Vit Plant's key suppliers and subcontractors attended the two-day event along with Bechtel corporate representatives, managers from the Office of River Protection, and the Vit Plant's senior management team. Alex Smith, Nuclear Waste Program Manager at the Washington State Department of Ecology, also spoke to attendees about the critical mission of the Hanford Site and the important role Bechtel and its supply chain plays in the successful cleanup of Hanford tank waste. Using feedback from the 2015 event, the Vit Plant incorporated interactive workshops that allowed suppliers to interact with project experts in targeted areas of importance, such as complex quality program requirements and the terms and conditions found in a lower-tier subcontract. The Procurement and Subcontracts team will continue to gather and analyze feedback from suppliers to identify areas for improvement in supply chain processes and the Vit Plant's competitiveness in the government market. The feedback also will influence future events. For more information about the event, visit http://bit.ly/2dohXYz. Learn about the Hanford Vit Plant and the people who work there through the Vit Plant Virtual Open House, a web-based multimedia experience that features displays, videos, and photos about the project. Each week, a new section of the virtual open house is opened. Eleven sections have been opened thus far that include information about early Hanford, the Vit Plant facilities, our employees and more. Later releases will highlight areas such as the construction site, more Vit Plant facilities and safety and quality. Follow the Hanford Vit Plant on Facebook, Twitter, and Google+ to be the first to know when new sections are opened. Use #meetthevit to ask questions or share comments/feedback about the virtual open house. 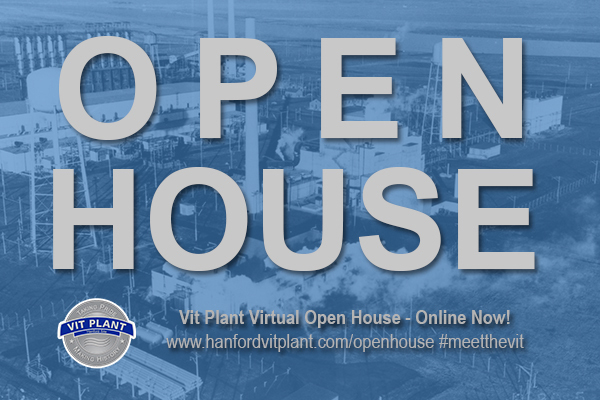 To view the virtual open house, visit www.hanfordvitplant.com/openhouse. Now, Sarah applies that experience and her degree in mechanical engineering to designing the Hanford Vit Plant, where she is the systems engineering manager. In this position, Sarah is responsible for managing the complex program that identifies, controls, and verifies achievement of the Vit Plant’s more than 11,000 technical requirements. "Because of my experience as a reactor operator, I understand safety control designs and system operations. I know what it’s going to be like during operations, and I apply that knowledge when I approach the design." View profiles of other Vit Plant employees at http://www.hanfordvitplant.com/profiles/. 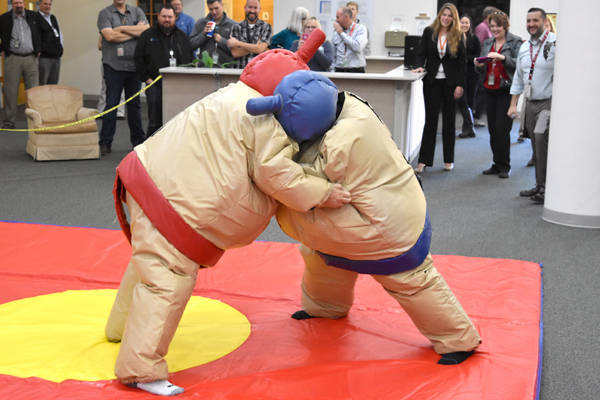 Vit Plant employees were treated to a sumo wrestling match at lunch as two senior managers squared off during a Breast Cancer Awareness fundraiser in October. More than $20,000 was raised from various fundraisers throughout the month to support the Tri-City Cancer Center Foundation. The fundraisers were coordinated by Women@Bechtel, a Bechtel employee resource group that promotes the development and advancement of women at all levels of the company and builds a more inclusive environment for women. 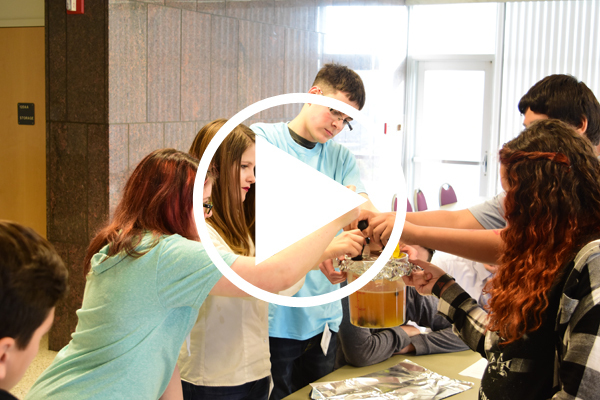 Volunteers from the Hanford Vit Plant brought the world of nuclear technology to freshmen at Delta High School during Nuke Tech Day at Washington State University Tri-Cities. Bechtel volunteers participate each year to showcase the importance of STEM careers to the next generation. Click the photo to watch a video from the event. The waste in the underground tanks on the Hanford Site is extraordinarily complex. The material consist of solids, semi-solids, liquids, and gases. In addition to water-like liquids, the tanks contain saltcake, a material with the consistency of wet beach sand, and sludges. 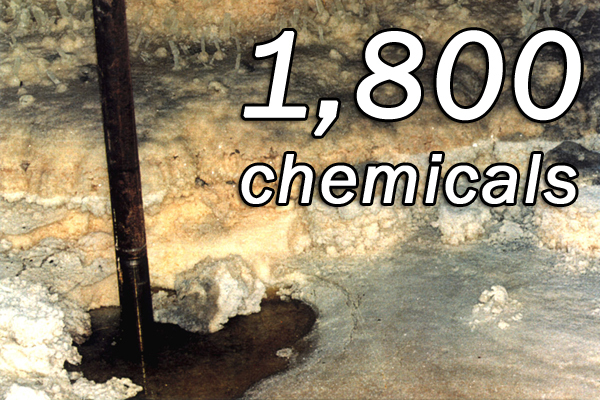 In fact, more than 1,800 chemicals have been identified in the tank waste. More than 300 veterans are employed at the Vit Plant. 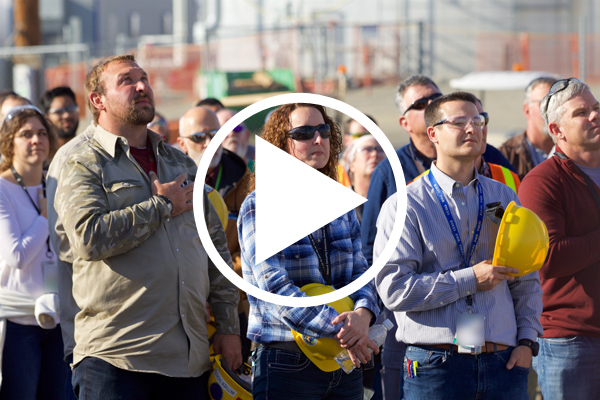 Employees at the construction site and Richland offices gathered beneath the flag at lunch for a short ceremony and the singing of the national anthem to celebrate Veterans Day. Click on the image to watch a video from the events that features many Vit Plant veterans in their military uniforms. 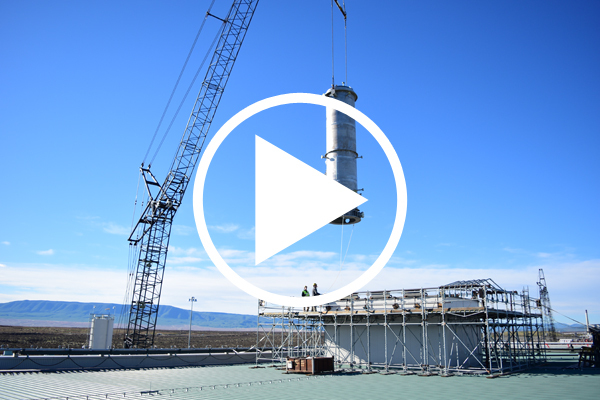 Watch as the last major piece of equipment is lifted into the Low-Activity Waste Facility. The 19-ton caustic scrubber is part of the offgas treatment system that will remove contaminants from the melter exhaust before it is released into the environment. Receipt of the caustic scrubber sets the stage for completing construction of the LAW Facility in 2018. View this and other Vit Plant videos on YouTube at https://www.youtube.com/user/HanfordVitPlant. Copyright © November 2016 Bechtel National, Inc., All rights reserved.